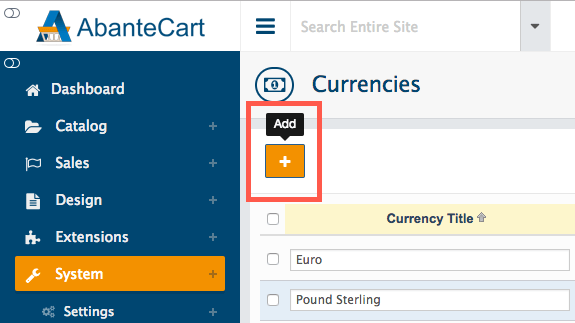 AbanteCart allows you to display multiple currencies on your store front, but payments are accepted in a primary store currency that you select. Note that if your payment gateway is configured to accept payments in multiple currencies, customers can be charged in an alternative currency, rather than your primary currency. The order total is calculated according to a store currency exchange rate that you define in AbanteCart’s Currency settings. To access Currency settings, head to System > Localization > Currency in the admin sidebar. Use the Plus (+) button at the top of the page to add a new currency. Status: Use the On/Off buttons to activate or deactivate the currency. Currency Title: Enter the name of the currency. Code: Look up and enter the three-letter ISO currency code from https://www.iban.com/currency-codes.html. All codes must be entered in capitals. Symbol Left: The left currency symbol (if the currency has one). An example is the pound sign (£) for pound sterling. Symbol Right: The right currency symbol (if the currency has one). An example is the euro sign (€). Decimal Places: The number of decimal places used for the currency. Most currencies use two decimal places, but some use more. Value: The value of the currency compared to your primary currency. If this new currency is going to be your primary currency, enter 1.00000. Otherwise, Google offers a simple exchange rate calculator: https://finance.google.com/finance/converter. Click Save to insert the new currency. 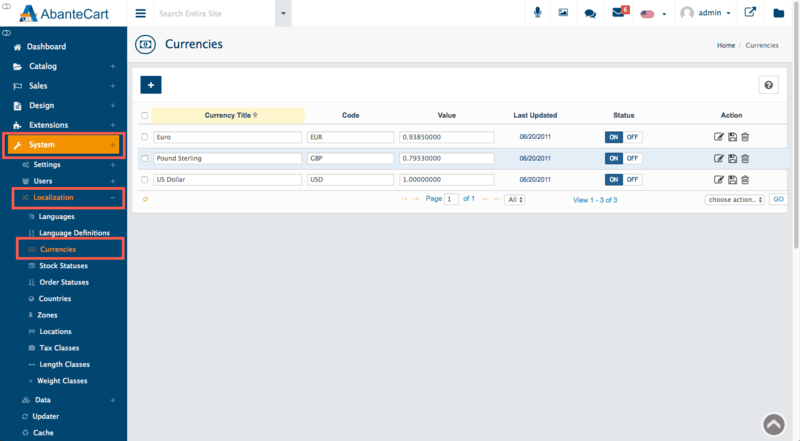 You can edit the Currency Title, Code, Value and Status from the Currencies page, but the most frequent edit is likely to be the Value, as it governs the exchange rate with your primary currency. In the example above, you can see that the US Dollar is the primary currency, with a value of 1.00000000. The Euro and Pound Sterling entries have lower values. To edit these values, simply type a new rate into the Value field and click the check icon. Then click the Save button to confirm the new rate. If you wish to modify the decimal point format, head to System > Localization > Language Definitions and use the Key filter to navigate to the decimal_point or thousand_point key. Enter the new symbol, then click the check icon. 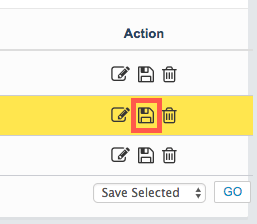 Finally, click the Save button to confirm the new rate.